Dementia is a broad clinical term that involves impaired mental function and memory so severe that it interferes with a person’s ability to function and live independently. Initially an individual experiences changes in activities of daily living (ADLs) such as driving, cooking, and money management. As the disease advances, he or she will have problems performing even basic ADLs such as eating, bathing, and dressing. There have been about 100 different diseases and conditions identified that include symptoms of dementia, with Alzheimer’s disease (AD) being the most common. AD and the related dementias (ADRD) are on the rise. The latest information from the Alzheimer’s Association indicates there are currently more than 5 million people in the United States who have AD, and this number is projected to increase to between 14 and 16 million by the middle of this century. One reason for this projected exponential rise is the fact that the No. 1 risk factor for AD is age. Currently, one of eight people aged 65 and older and almost one-half of those aged 85 and older have AD.1 Therefore, as the baby boomers age and reach their 70s and 80s, the number of people with ADRD is projected to be immense. The prevalence of AD patients in long term care (LTC) communities is already very high and growing. Approximately 68% of nursing home residents and up to 67% of those living in assisted-living facilities have some degree of cognitive impairment related to ADRD. But about 70% of those with AD are still living at home.1 Coupling this with the fact that people with AD are three times more likely to be hospitalized than those in the same age group without AD, healthcare professionals know that many of these individuals are also using short-term rehab and home health services. Many studies have shown a significant correlation between the daily problems faced in LTC regarding the challenges of caring for patients with AD or dementia. AD and dementia are often identified as a root cause of common LTC problems (see Table 1 below). To reduce these problems, it’s necessary to improve the interventions, or these challenges and poor outcomes will continue to recur. 3. Person-centered care: It is important to honor and integrate an individual’s life story into daily care as much as possible. This is especially important for those with AD or dementia because those individuals display better attention to activities of interest and strong long-term memory. Therefore, if LTC staff members engage the person in familiar activities, using familiar supplies associated with a familiar routine, they will facilitate higher levels of engagement, independence, and emotional well-being. Delivering dementia-capable care requires training and ongoing commitment. The entire interdisciplinary team, including administration, direct care staff, indirect care staff, and therapists, must work together to facilitate positive outcomes. AD and dementia care is powered by specific skills and supported by leadership and an infrastructure designed to enable and encourage implementing dementia-capable care skills and techniques. It is of utmost importance that the LTC care team realizes there is a cause and effect relationship between training, care, and outcomes, and the team must take responsibility for the outcomes. Simply stated, staff provided with effective practical dementia skills and empowered and supported to use them in daily care will create positive outcomes. Staff without training or implementation support and assistance will unknowingly create negative outcomes. • Paradigm shift: Everyone must learn what is possible for patients with AD or dementia to accomplish. Typically staff members hold low expectations, and this limits patients’ potential. It is critical to break through the negative beliefs and teach what is possible from a positive perspective. For example, “a wandering rummager” can still walk, desires to engage and explore the environment, and can use his hands to hold and move objects. These positives can be parlayed into quality outcomes instead of squelching the remaining abilities with negative labels. • Stages: Staff must learn the functional indicators of the various dementia stages along with the key remaining abilities and the best ability to function that corresponds with each stage. • Compensatory approaches: All staff are taught how to optimize function by compensation, which means change the environment to support and not hinder, change the approach to improve understanding and gain trust, and simplify and adapt ADLs and other activities to the appropriate challenge level. • Communication: Staff must learn stage-specific strategies to maximize understanding between the client and the caregiver. • Behavior management and prevention: Staff members are taught stage-specific approaches to understand the meaning behind behaviors and techniques to minimize or calm aggressive behavior, should it occur. There are multiple statements in the Medicare Benefit Policy Manual that support therapy services for this population. Specialized dementia therapy is needed for individuals in short-term rehab beds who have AD or dementia as a complicating factor. • how to document such skilled therapy services to receive reimbursement under Medicare Part A and B. 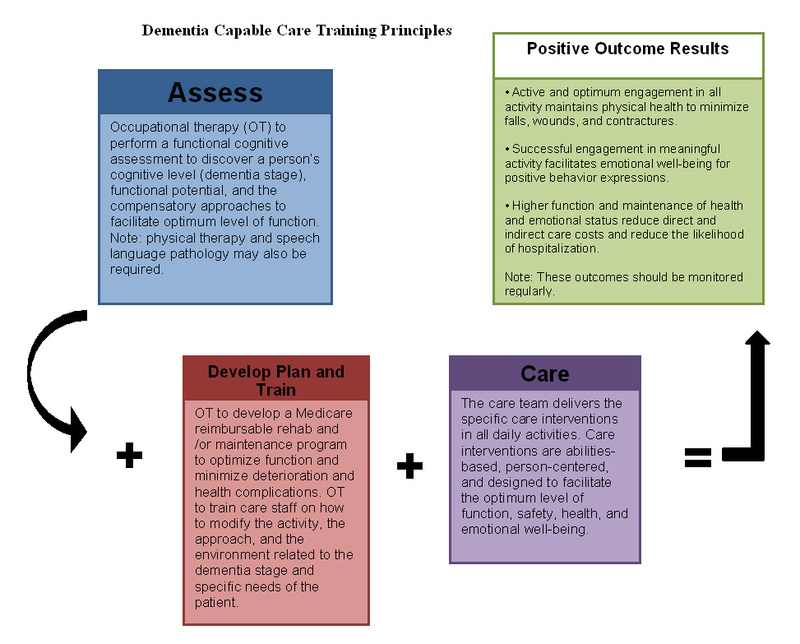 To facilitate positive outcomes, the dementia-capable care training principles and skills must be delivered in a supportive care model process as shown in Diagram 1 below. We must begin using AD and dementia prevalence statistics and research studies to inform our care. ADRD aren’t going away; instead they will likely be the largest diagnostic group seen in LTC. Unmanaged or poorly managed ADRD create bad outcomes. However, there is an opportunity to create positive outcomes by empowering and supporting dementia-capable care in the workplace. This interdisciplinary, proactive care approach will enable patients living with AD or dementia to thrive, along with the people and businesses serving them. — Kim Warchol, OTR/L, DCCT, an occupational therapist specializing in dementia management, is founder and president of Dementia Care Specialists in Hillsborough, North Carolina. 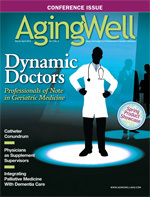 Having educated more than 5,000 therapists and other healthcare professionals on an abilities-based, person-centered approach to dementia evaluation, treatment, and programming, she was instrumental in the advocacy effort that led to the 2001 Centers for Medicare & Medicaid Services’ memorandum prohibiting the denial of therapy services based solely on a dementia diagnosis. 1. Alzheimer’s Association, Thies W, Bleiler L. 2011 Alzheimer’s disease facts and figures. Alzheimers Dement. 2011;7(2):208-244. 2. Amella EJ. Factors influencing the proportion of food consumed by residents with dementia. J Am Geriatr Soc. 1999;47(7):879-885. 3. Beck C, Ortigara A, Mercer S, Shue V. Enabling and empowering certified nursing assistants for quality dementia care. Int J Geriatr Psychiatry. 1999;14(3):197-211. 4. Gitlin L, Corcoran M. Occupational Therapy and Dementia Care: The Home Environmental Skill-Building Program for Individuals and Families. Bethesda, MD: AOTA Press; 2005. 5. Guideline for the prevention of falls in older persons. American Geriatrics Society, British Geriatrics Society, and the American Academy of Orthopaedic Surgeons Panel on Falls Prevention. J Am Geriatr Soc. 2001;49(5):664-672. 6. Rubenstein LZ, Josephson KR, Robbins AS. Falls in the nursing home. Ann Intern Med. 1994;121:442-451. 7. Voyer P, Verreault R, Azizah M, Desrosiers J, Champoux N, Bédard A. Prevalence of physical and verbal aggressive behaviors and associated factors among older adults in long term care facilities. BMC Geriatr. 2005;5:13. 8. Zhao Y, Kuo TC, Weir S, Kramer MS, Ash AS. Healthcare costs and utilization for Medicare beneficiaries with Alzheimer’s. BMC Health Serv Res. 2008;8:108.. The most significant predisposing factor identified for aggressive behavior in long term care (LTC) is cognitive impairment severity. This means the more advanced the stage of dementia, the more prevalent the aggressive behavior. Studies show the higher the dementia severity and/or functional dependence, the higher the direct and indirect care costs.